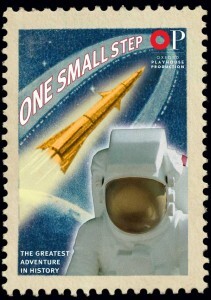 WEST LAFAYETTE, IN — Celebrating the 40th anniversary of the moon landing, “One Small Step”, is a new play written by David Hastings, directed by Toby Hulse and produced by Oxford Playhouse. The play will be presented at Purdue University’s Loeb Playhouse in West Lafayette at 7 p.m. on Oct. 28-29 and at 4 p.m. and 7 p.m. on Oct. 30. These performances are presented by Purdue Convocations. The Purdue presentation includes a post-show discussion with the actors after all four performances. The “space race” between the United States and the Soviet Union to send the first man to the moon captured the imagination and attention of the entire world. This smash hit play from Oxford Playhouse in England was launched in 2008 at the Edinburgh Festival Fringe (The Fringe) to five- and four-star reviews. “One Small Step” is an action-packed flight that reflects the drama of the space quest. The play features dozens of characters (41 to be exact) -from German scientists, Russian cosmonauts, and American astronauts (including the following Purdue University Graduates: Neil Armstrong, Gene Cernan, Roger Chaffee, and Gus Grissom) to JFK and Walter Cronkite. Using a stage filled with vintage electronics and flea market finds, actors Robin Hemmings and Oliver Millingham deliver an inventive piece of visual theatre that is as comically low-tech as Apollo 11 was high-tech. Originally created to celebrate the 40th anniversary of the Apollo 11 mission, “One Small Step”, like the Apollo’s success, celebrates the unbridled creativity of humankind. This show is recommended for grades 2 and up, but space travelers of all ages will enjoy the ride. Tickets are $18 for adults and $12 for children 18 years and younger, Purdue students and Ivy Tech Lafayette students. Tickets are available at the Elliott Hall and Stewart Center box offices at 765-494-3933 or 800-914-SHOW. Tickets also are available through Ticketmaster outlets. Discounted tickets for groups of 10 or more can be ordered at 765-496-1977.